Rectangular Desks – 1600 x 800mm to 2000 x 800mm, with either ¾ depth or full depth backpanels, and optionally with bow fronts. Corner Desks – Corner Desks 1600 x 1200/800mm to 2000 x 1200/800mm, with either ¾ depth or full depth backpanels, and optionally with bow fronts. Freestanding Returns – May be used with both rectangular desks and corner desks. Available open, with drawers, cupboard or combination drawers and cupboard. 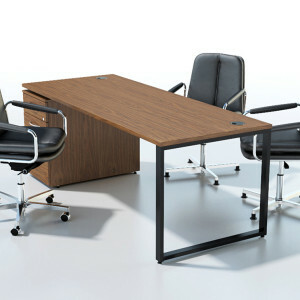 Category: Executive Desks. Tags: Executive Desk, Fulcrum Pro. Fulcrum provides the benchmark for high quality executive and managerial desks, in veneer, solid hardwood and high gloss lacquer. Fulcrum combines an unmistakable presence with unobtrusive yet highly effective provision for cabling and other supporting elements of modern technology. 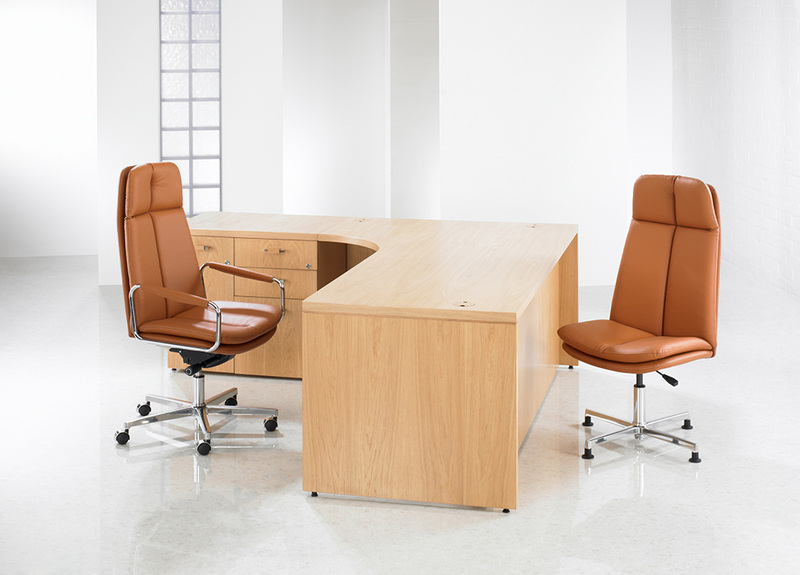 Fulcrum CE is distinctive range of contemporary executive desks and storage of the highest quality, combining modern styling with traditional craftsmanship. The palette of finishes comprises a wide choice of veneers, glasses and high gloss lacquers. These finishes may be combined in a multitude of ways to create office suites tailored to meet a very wide range of environments. 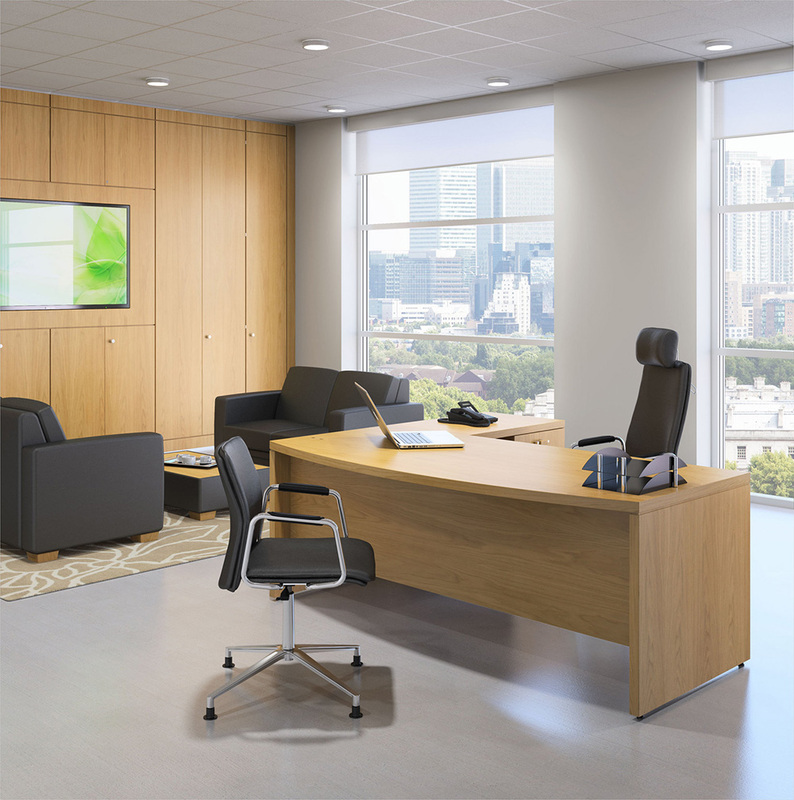 Fulcrum CE enables you to create modern executive suites of great presence. While the fundamental design is inherently contemporary the appearance of each individual suite can vary widely according to the specifications and finishes selected. The key visual elements are the desk top, the supporting frame or panel and the accompanying storage. 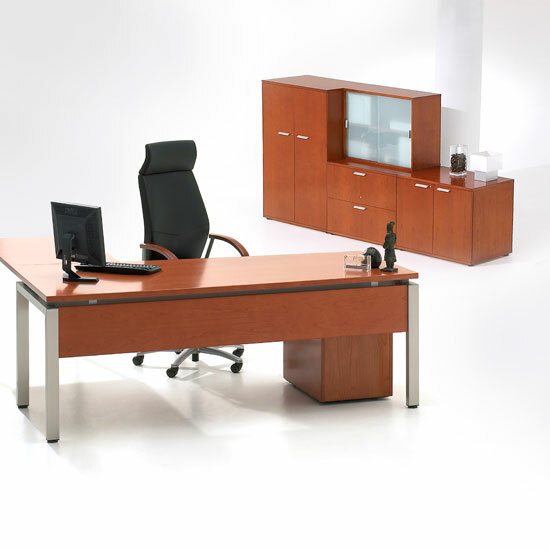 The desk top is always slim and elegant, and may be in veneer or glass. Each of the many available veneers creates a different look, as do the variations of glass: clear, frosted, white, black or green. The desk top is supported on either a rectangular metal frame or 60mm thick timber panel: if metal it may be chrome or epc coated black or white: if timber it may be in veneer or high gloss white or black lacquer. Storage units (including the desk-supporting storage) comprise an internal carcass clad with external panels. The cladding may be in veneer or high gloss lacquer. The same options apply to the doors and drawers but they may be (and commonly are) specified in different finishes. 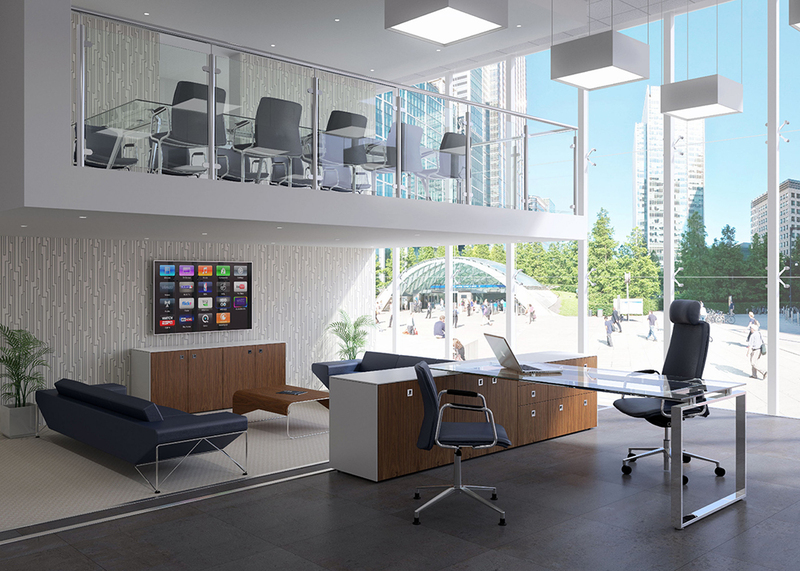 A small sub-range of Ambus executive desks of a distinctive contemporary design. There are three configurations of workstations, each comprising a worksurface supported at one end on a rectangular section hoop frame and at the other on a low storage unit, plus three sizes of single pedestal desk. Frames are available in white, Black, Zinc and Faux Chrome (Faux Chrome is a chrome-effect paint finish). 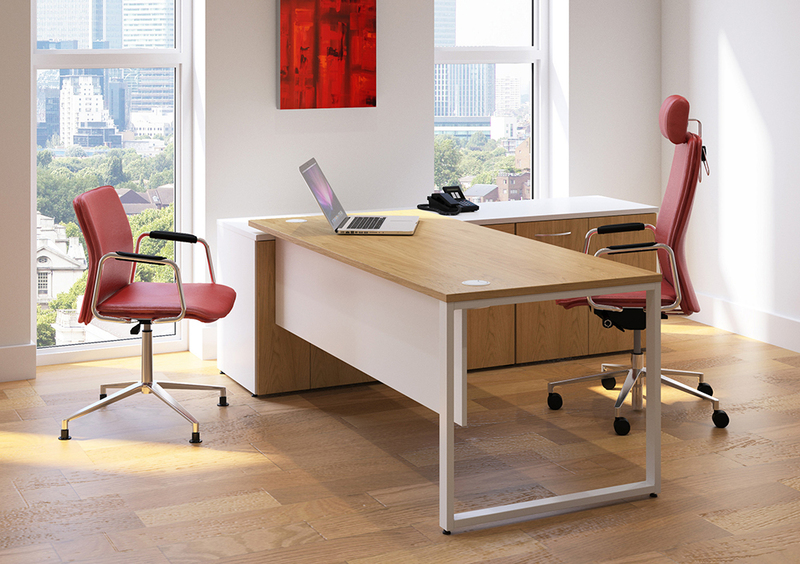 The Oblique Intuition desking range maintains the traditional attention to quality and detail. Desk tops are 30mm thick Medium Density Fibreboard with solid wood lipping on all edges. Stainless steel leg frames include height levellers as standard. A choice of three veneers: Cherry, Maple and Dark Walnut, are complimented by the stainless steel legs, and silver detailing throughout the range. Flexible enough to meet your every requirement, yet simple enough to change according to the needs of today’s fast moving office. Tables, pedestals, cupboards and bookcases which suite with the desking, are all available with the same silver finishes to highlight the beauty of the real wood veneers. 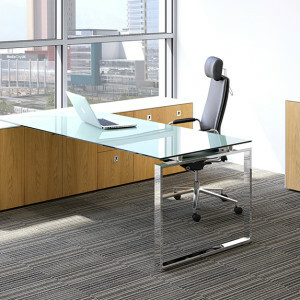 Martin rectangular desks provide a less formal and more friendly style of furniture for the modern office or executive space. Frames are available in solid oak or walnut with tops available in real wood veneer to match, or in a combination of laminate with solid wood edge profiles. This feature is also taken through to the modesty panel which also shows the same attention to detail and the solid wood edge profile.